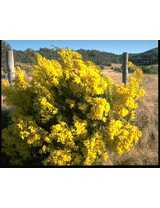 Description: Erect or spreading shrub or tree to 6 m high; branchlets angled or flattened towards apices, with antrorse, spreading to appressed, white-hyaline hairs along ridges or glabrous. Phyllodes ± linear to very narrowly elliptic or narrowly lanceolate, straight or slightly curved, 2–5 cm long, 2–5 (-7) mm wide, ± appressed hairy on margins (sometimes glabrous), midvein fine and ± prominent, lateral veins few and faint, apex acute with a straight mucro; 1 ± prominent gland 1–7 mm above pulvinus, sometimes a second gland; pulvinus < 2 mm long. Inflorescences 8–25 in an axillary raceme; axis 1.5–7.5 cm long; peduncles usually 2–5 mm long, glabrous or minutely hairy; heads globose, 10–20-flowered, 3–5 mm diam., bright yellow, sometimes paler yellow. 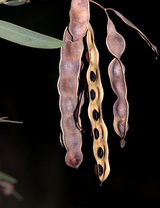 Pods straight to slightly curved, ± flat, ± straight-sided to slightly and often irregularly more deeply constricted between seeds, 3–9.5 cm long, 5–8.5 mm wide, firmly papery, glabrous, ± pruinose; seeds longitudinal; funicle filiform. Distribution and occurrence: chiefly in coastal districts; north from Nerriga and west to Inverell; widely cultivated. 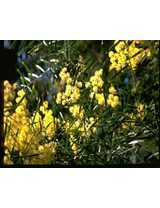 Grows in eucalypt forest and woodland, in rocky and sandy soil, often along rocky streams. A somewhat variable species, particularly with regard to the hairness of the margins of the phyllodes, to which the name refers. 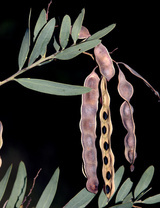 Some plants, particularly from the southern end of the range appear to have totally glabrous phyllodes. 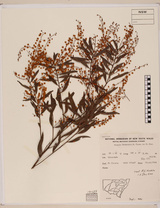 In the lower Blue Mountains - Nepean area there is a form with glaucous-pruinose, broad phyllodes (up to 7 mm wide), which requires further investigation of status. 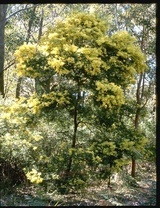 Fringed Wattle is commonly cultivated. 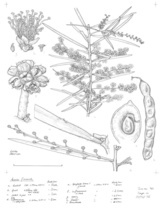 A locally naturalised population of Acacia fimbriata has been reported from Grahamstown, South Africa, in 2011.